The Ferreira name is associated with having a delicious culinary experience: getting together, sharing a meal and having a great time in good company. Conscious of this privileged status it enjoys in its community, the Groupe Ferreira is eager to give back to this community by engaging with and contributing to several charities. 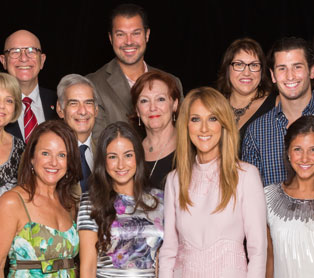 We are thus proud of over 15 years of involvement with the CHU Sainte-Justine Foundation. Again this year, we were determined to be there for the Foundation by catering a cocktail party for 250 guests, during an evening organized as part of the “Chœur à cœur” event, co-presented by the Groupe Ferreira with SNC-Lavalin, in collaboration with the very generous Céline Dion. Our involvement with Centraide takes a totally different form. Centraide of Greater Montreal and the Montreal Impact Foundation joined forces for the “Centraide Cup” (held on September 6 and 7 with the theme: Moving brightens lives). The Groupe Ferreira employees formed a soccer team for the cause! This friendly tournament brought together 31 teams, representing local companies and organizations, to raise funds to fight poverty and social exclusion in Greater Montreal. The funds raised ($465,000) will go to the Centraide 2014 campaign and the Montreal Impact Foundation.